I admit to having more than my share of patterns in my stash that I haven't made before (this one was in my stash for a year). I buy some patterns for the sole purpose of seeing how the designer puts the bag/quilt/whatever together. I'll buy other patterns because I'm inspired by something on the cover. Then, there are patterns that I buy because I actually want to make the item. The Super Tote by Anna Graham of Noodlehead is all of these things. I can't even count the number of times that I've seen a picture posted online of this bag and thought that I should make it. I'm not sure what finally pushed me into starting the bag, but I'm glad I did. This bag has a lot of components to it, and this can give you ways to customize it to suit your needs (of course I had to change something), and I'll give you more information on my changes a little bit farther down in the post. 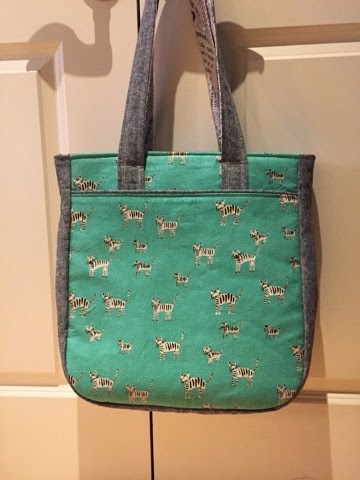 I really like this bag, and I think it would be doable for for an advanced beginner to sew with the caveat that I highly recommend following Anna's well-written instructions. I can't stress the importance of following instructions when you are first starting to sew bags (and I do make the same recommendation for experienced sewists that have decided they want to make a bag). I know that I have said it before, and most patterns I see also remind you to read through all of the instructions before starting the project. Do it. Seriously. This will allow you to see where you are headed before you get there. The largest area of concern for me is with the final top stitching. It wasn't fun for me...at all. Not even remotely, so please continue reading and I'll explain more later. One of the first decisions that you will make concerns interfacing. This is an essential part of the bag, and the look of your finished bag will vary significantly depending on the fabrics and interfacing you have chosen. For this project, I was working with 2 different cotton/linen blends for the exterior, Tiger Stripes Canvas by Alexia Abegg for Cotton + Steel and Robert Kaufman's Essex Yarn Dyed Linen, and a quilting cotton for the lining. The canvas and linen fabrics are heavier than the quilting cotton, but they are still quite soft. The pattern offers some recommendations on interfacing fabrics of varying weights. If you have ever read my blog before or seen my Instagram feed, you already know that I make a lot of different bags which made me familiar with how different interfacings behave, especially Pellon and Annie's Soft and Stable. Even with the knowledge that I have gained, I still wanted to find out what other people were using. The recommended interfacing is Pellon SF-101 (ShapeFlex) with a layer of Pellon 808 (Craft Fuse). I don't especially love 808 because it feels crunchy to me and holds more of a crease, so I wanted to try to find something else. To be honest, a lot of the interfacing in bags really comes down to a personal preference. Do you prefer a bag that is able to stand on its own, or do you want a more slouchy bag? Are you looking for a crisp finish or something that will move and flex more easily? 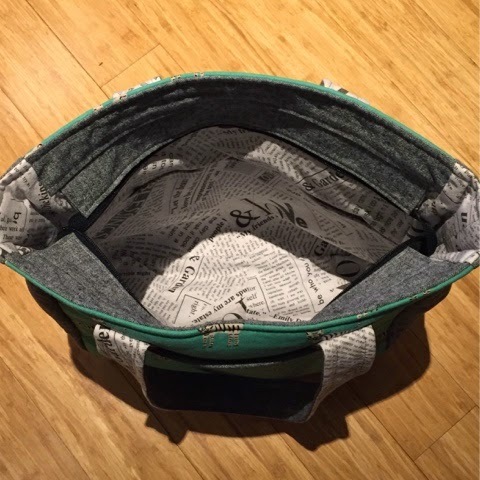 I wanted the bag to at least mostly stand on its own but not to look or feel stiff, and I really didn't want it to look like a puddle of fabric when you put it down. I hadn't had an up close look at a sample of the bag before I stated working on it, so I had opted to go with the SF101 and add a fusible fleece to the exterior pieces. After I cut the fleece and fused it to my completed exterior pieces, I Wonder Clipped it together with the gusset piece to see how it would behave, and I wasn't very happy with the results. It wasn't holding its shape at all. To remedy that, I cut 2 pieces of Soft and Stable (foam interfacing) and basted them to the completed exteriors. Perfect! So, interfacing recap - exterior has a layer of SF101, 987F (the fusible fleece), and Soft and Stable. The gusset piece only has the 2 layers of SF101, so the bag will stand on its own, but not using the foamy interfacing in the gusset allows the bag to remain super squishy and soft. Now I'm going to backtrack to an earlier step and share more information about my modifications. The first modification I made was with the straps. I cut, fused, and sewed the straps right sides together as the instructions are written, but I added a thin strip of fleece to the quilting cotton side that was cut and fused BETWEEN the stitching. Again, the fleece was fused after the strap pieces were sewn together. The fleece stays out of the seam allowance, and I get a little bit more padding on the shoulder because I know that I may cram a bunch of stuff into the bag on occasion. After the fleece was fused, I turned the straps right sides out and top stitched as instructed. My second modification was to use a sew-in invisible snap for the exterior pocket instead of the optional regular magnetic snap. It was an easy change and really more of a minor adjustment than a modification, and I prefer the cleaner look. Modification number 3 was with the recessed zipper. I wanted mine a little bit longer to make absolutely sure that it would be long enough for the recessed area to lay flat against the bag when it was unzipped, so it's about an inch longer than the pattern suggests. Another modification to my bag was to take a suggestion a little bit farther. I felt like I wanted to make sure the pleated gussets didn't start to rip or come apart, so I decided to bar tack the base of the pleat. While this can be done by simply using a zig zag stitch with a stitch length of zero and/or dropping your machine's feed dogs, my sewing machine will do an automated bartack. I had never used the function, so I thought I'd test it. While I was preparing to select the stitch, I saw something that I thought was even better, a cross bartack! I figured it would give me the desired benefit of the reinforcing the area plus it would look more interesting, and boy was I right. I love it. The final modification was to simplify the interior. I am not a big fan of elasticized pockets in general, and with my frequent bag switching, most of my smaller regularly carried items are in pouches. I measured the height of the pattern piece for the interior pockets, marked a line at that height on the exterior pattern piece, and I folded down the top edger of the pattern piece at that line. 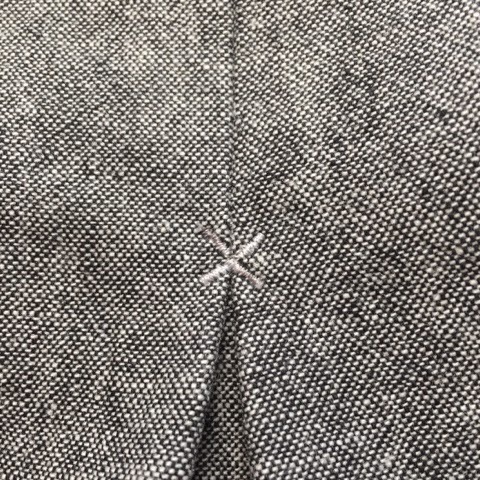 From there, I cut 2 pieces (I prefer fully lined pockets), sewed them right sides together along the top edge, pressed and top stitched what would soon become my new slip in pocket. To not have a big gaping pocket, I marked a vertical line through the pocket to divide it into two smaller pockets. I only wanted a pocket on one side, so that was basically it for the interior. It was time to move on and sew the gussets together with the sides. Ok, about that topstitching. With the combination of the linen plus a bunch of SF101 with pleats on the gussets and Soft and Stable on the main exterior pieces, I had a large difference in thickness as I topstitched. The problem wasn't with the seam between the gusset and the sides, it was with the gusset itself. Sewing through the non-pleated part of the gusset is a piece of cake. It's just the gusset with its 2 layers of interfacing and the lining. The pleated part is 3 layers of exterior fabric, 6 layers of SF101, plus 3 layers of lining fabric. So, the jump between the thicknesses is tricky, and you may find you will have better results if you try different types of needles or different stitch lengths. That was honestly, the one thing that made me want to tear my hair out, but I knew it was the end of the road. I just needed to make it all the way around the bag and I would be done. It's doable. Really. It may be frustrating, but it can be done. So, that's about it for my adventures with my Noodlehead Super Tote. I know that there will be another one in my future, and it will probably be before the fall when the a Pacific Northwest's famous rain starts up again so my linen can stay nice and dry at home. It really is an amazing bag, and I am enjoying carrying it. Much to my surprise, I've even carried it more than 1 day in a row. Wow. Maybe there is hope for me after all! Thanks for your very helpful review. I'm about to sew my first Super Tote and was planning to use Soft and Stable, but was wondering what to do for the gussets. Now I know! Your version is beautiful. I especially like that cross bar tack of yours -- clever, functional, great-looking. Thanks!